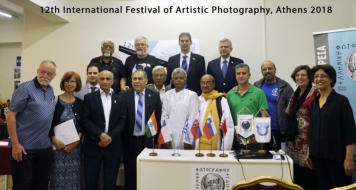 The Athens International Festival of Artistic Photography®, organized since 1999 by the Hellenic Photographic Society, usually in May of each year, embraces the photographers and contributes decisively to the promotion of artistic photography in our country. It has been established in Greece as the top meeting in the field of photography and enables both prominent photographers and new creators to present remarkable photographic quests. Along with the exhibitions program, the festival's activities are enriched by remarkable speakers from Greece and abroad participating in round tables about photography or presenting lectures on specific themes such as “Pictorial Photography” or “Miniature in Photography” but also on specialized subjects such as “Food”, “Genius Loci”, “Face- Mask”, thus covering a full range around the history of photography and the peculiarities in its modern tendencies.